It is designed for the specific motorcycle , no chain guard , but incorporated with the OEM chain guard it protects the rear shock from mud, and also protects driver’s and passenger’s foot from water. It is made from ABS plastic in glossy black with acrylic coating and UV protection. 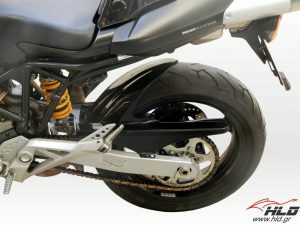 It can be mounted directly on the bike , and also can be painted without any special treatment . This kit contains all the parts needed and instructions with photographs for easy installation. All components are made ​​of stainless or galvanized steel for durability and protection against rust. You do not need to make any conversion on the bike .